Before working with groups in the tools of Etudes, you need to establish your groups. The tools that allow group-specific access include Announcements, Discussion, Resources and Schedule. Students can be assigned to one or more groups manually by the instructor. Click on Roster on the left menu of your site. Click on Groups at the menu, and then on Add. A window will open where you can establish your new group. Give your group a title. In the Site Members box, you’ll see a list of all enrolled students. Choose the students you wish to add to this group. You can select more than one by holding down the Alt/Command key while clicking on each student. Once you’ve highlighted your choice, click on Add to add students to the group you created. If you decide to remove some students from the list, select them in the list on the right side and click on Remove above the list. Click Done at the bottom to finish creating the group. Click on Add, again, to add another group and repeat the process. When you’re finished creating groups, you’ll see the list of the groups you’ve established, along with the number of students assigned to each group. 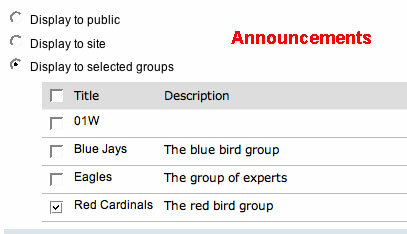 You can edit the title of the group and its membership by clicking on the title of the group. You can delete a group by first selecting the group (checkbox in front of its name) and clicking on the Delete button. Dropped or blocked students are not displayed in the group lists. Also, if a student was added to a group and was later dropped, he or she will no longer be listed in the group. Students can be in more than one group. If you create different groups as the term progress, leave the previous intact, if they are connected with specific discussions, assignments, etc. so that the access permissions remain in place. 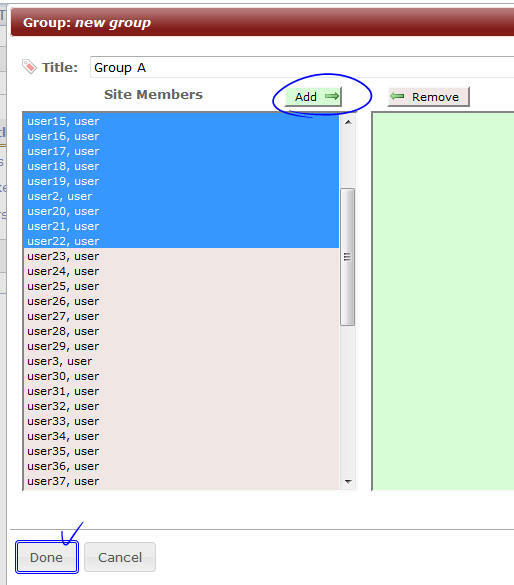 Once you have established groups in your site, you can use the groups in specific tools, as described below. When creating an announcement, below the large white box where you type out the announcement, there is a category: Access. To make the announcement available to anyone from the Sites browser (Etudes Gateway), without needing to log into Etudes, select Display to public. To send the announcement to the whole class, choose Display to site. If you want this particular announcement to be completed by just one or two particular groups, choose Display to selected groups. A list of all available groups will appear. Check next to the group(s) you want this announcement to go to. Only students in checked groups will see this announcement. Note: In the example on the right, see the “01W” reference. This reflects the section whose roster was uploaded into Etudes. A section (i.e. 01W, 3456, etc.) is treated like a group. If you combine more than one section in one site, you will see all the sections listed and you can send different announcements to each section. When uploading a resource, you will see a section titled: Access. If you want to make this resource available to non-class members, choose Display to non-members (publicly viewable). To make the resource available to your class, choose Display to site. If you want this particular resource to be available to just one or two particular groups, choose Display to selected groups. A list of all available groups will appear. Check the group(s) you want to access this resource. Only students in these groups will access it. 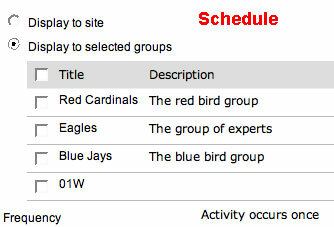 When adding an event to the schedule, you can limit the event to show to only particular groups. To do so, choose Display to selected groups. In the list of all available groups, check the group(s) you want to view this event. Only students in checked groups will see this event. If you want the entire class to see the event in the Schedule, choose Display to site. You can limit discussions to members of only particular groups. This is a great feature if you want your students to collaborate. They will have a place where they can discuss their project and other class members cannot “listen in.” It can also help make a large class feel intimate. Discussion groups are established at the Forum level. To do so, in Discussions, click on the Manage link. Click on Manage Forums. Then click on the Forum. In the Allow Access area, check Allow Access to Selected Groups. The list of groups that you created in Roster will appear. Check the group(s) you want to access this forum. When you return to the Discussion Home, you will see your new forums. Students will only have access to those forums accessible to groups they are a member of.